The Golden-plumed Conure (Leptopsittaca branickii) is affected by the loss and degradation of up to 90% of its habitat in Colombia. 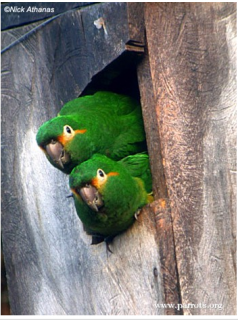 Outcomes: The Parrots in Peril team learned that the range for these species is wider than previously thought. This critical work also underlined the importance of Podocarpus National Park for all of the threatened species, the Golden-plumed Conure (Leptopsittaca branickii), the White-breasted Conure (Pyrrhura albipectus), and the Red-faced Parrot (Hapalopsittaca pyrrhops). Where found: Scattered throughout patchy ranges in Andes highlands of all three ranges in Colombia; also Ecuador to S Peru. History: The Golden-plumed Parakeet (Leptosittaca branickii) has a wide but scattered distribution in Colombia, Ecuador and Peru. Its decline has been considerable in Colombia and Ecuador, and in Peru in the past it has been stable but now habitat destruction threatens the population further (H. Lloyd in litt. 2007). Within its range, it is found in local pockets and considered nomadic (Fjelds and Krabbe 1990, Collar et al 1992), making it difficult to study, which is why it is a poorly known species. Ecology: The Golden-plumed Conure is found from 2400-3400m (7872-11,152 ft) in temperate forest, elfin woodland, cloud forest and treeline shrubbery. Birds feed on Podocarpus cone seeds, other seeds, Ficus and maize. They are generally seen in noisy and conspicuous flocks outside the breeding season. Birds make daily altitudinal movements, upland, returning to lower forests to roost.